I've become a little obsessed with collecting bits of nature lately on walks through my neighborhood. I feel a bit like a crazy squirrel running around gathering supplies to stock up for winter. Do you ever feel like the world has become a bit noisy with lots of distractions to take you away from enjoying the little things in life? I feel as though I loose sight of what is right in front of me, like a chirping bird outside my window or the kindness of a stranger. In the hustle and bustle we call living, those simple but meaningful things get ignored. To refocus, I find that taking a quiet stroll through my neighborhood can do wonders. It really puts my mind at ease. Last week on one of these afternoon walks, I was mulling over what I could create to share here today. Lost in my thoughts under the oak trees, I didn't seem to notice that acorns were literally falling from the sky until one just about hit me in the head. And that is when I stopped to really take in what was around me. Littering the ground were acorns, leaves, and branches showcasing the beauty of nature. This beauty is fleeting, though, and will be destroyed if left out in the sun and wind. It can only last if it can be preserved and taken care of. With that realization, I knew exactly what I could create. During the fall last year, those same trees had begun loosing entire branches full of leaves and as they dried alongside the road they faded into the most incredible shade of green. I had gathered a bunch and brought them home to dry. You may have seen some in my decorated mantel post here a few weeks ago. I pulled out the box filled with the rest of what was gathered and started crafting. 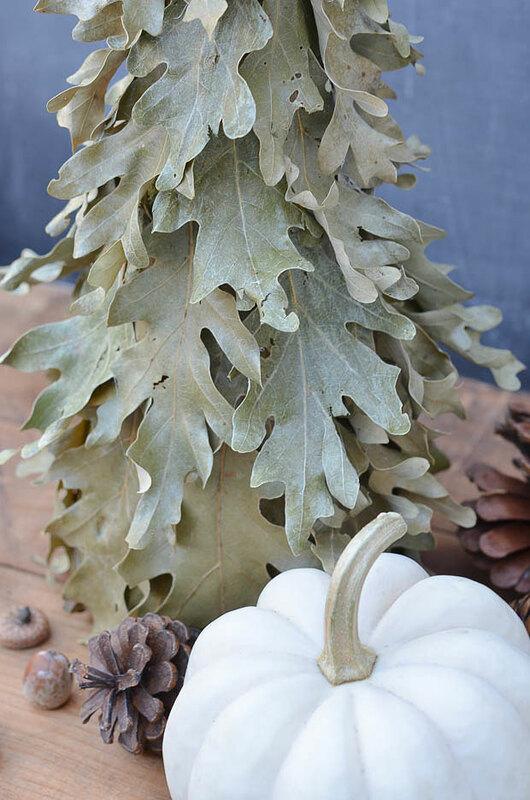 What I came up with was a tree covered in the preserved green oak leaves and topped with a acorn. 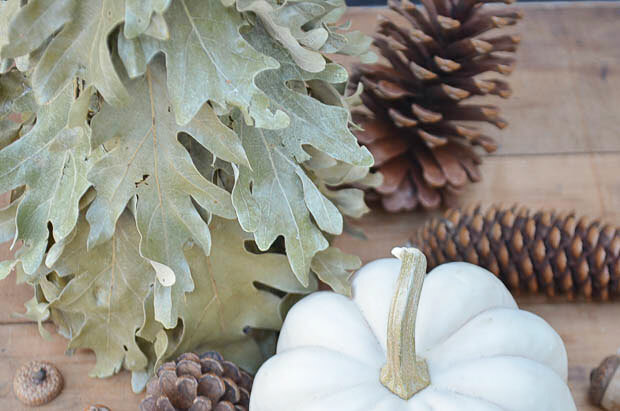 It is truly the perfect way to bring a piece of the fall indoors with you. The beauty of the shape and color, the fresh smell, the feel of the crispness of the leaf. All reminders of the fall season. Glue I used hot glue to get the project done quickly, but I'm not sure how well it will hold up over time. 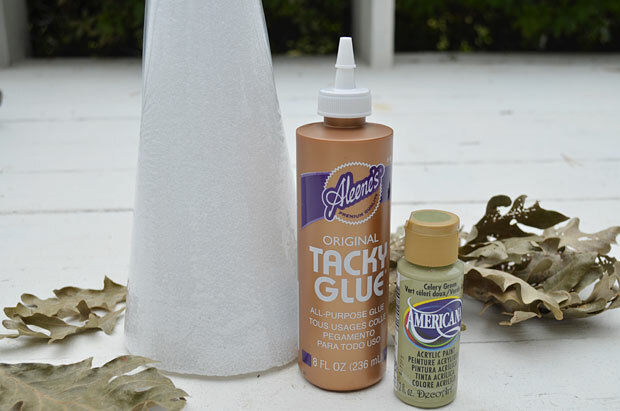 If you have the time to work with your tree, it would be best to use craft glue. 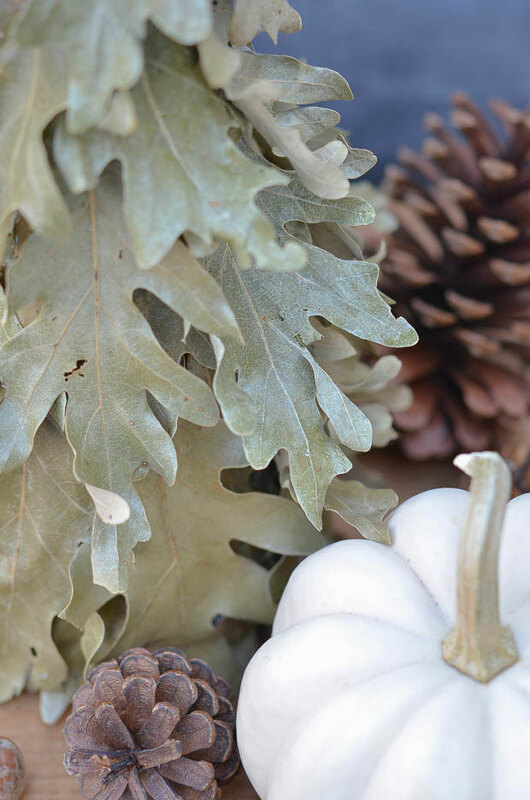 Craft Paint to match whatever color your tree will be. You don't want any of the white peeking through in places that might not have a leaf covering it. Begin by paining your cone with the craft paint and allow it to dry. If your leaves are freshly gathered, this step can probably be skipped. But since mine were from last year, they needed to be rehydrated and made pliable. I laid the leaves out on a sheet of wax paper and spritzed them with water. They sat for about half an hour and became easy to bend and shape again. If you try to attach the brittle leaves, they will crack and break as you work with them. Cover the bottom portion of the tree completely with leaves. The leaves you use here don't have to be the prettiest and can even be broken pieces. Their purpose is to ensure that the entire bottom third of the cone is completely covered. Then begin layering on leaves over the base going around in circles and working your way up. Use the largest leaves on the very bottom, medium for the middle, and the smallest leaves for the top. For this bottom level, I glued both the top and a section of the bottom of the leaf to the cone. As I worked my way up, I just attached the leaves at the stem end. This allows your leaves to maintain the natural curl that develops around the edges as the leaves dry. Be sure that you are completely covering the cone. 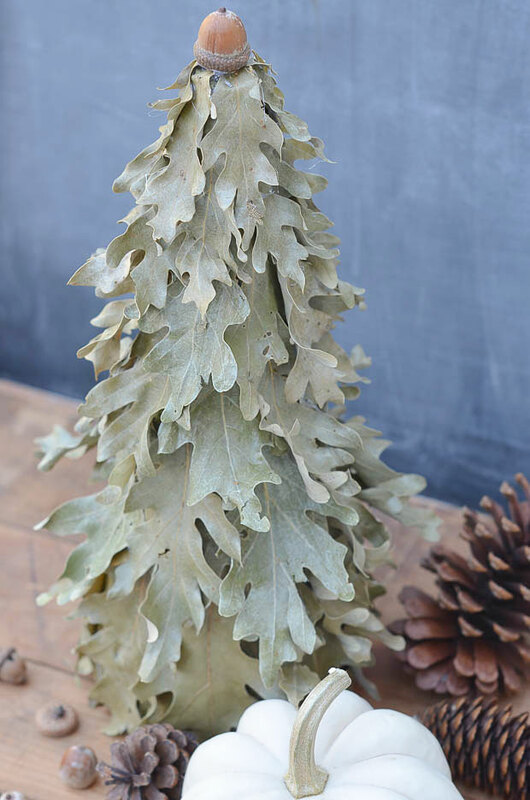 At the top of the tree, allow the leaves extend past the top of the cone just a bit. 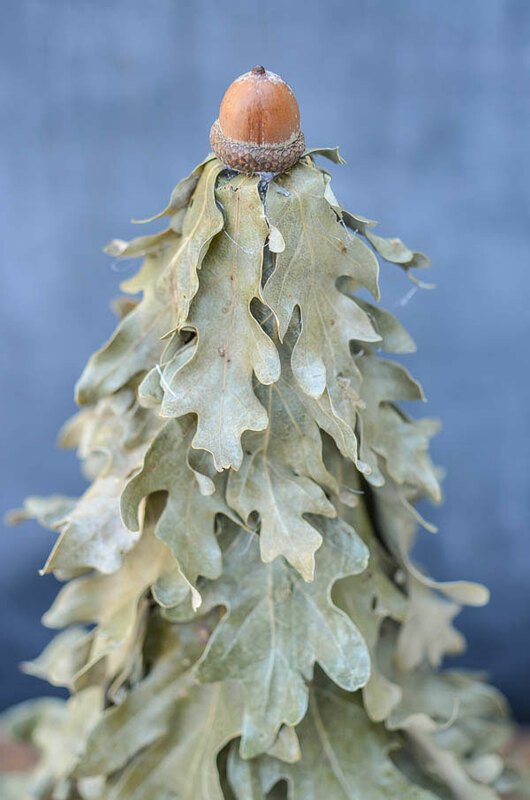 Fold this part over to completely cover the tip of the cone and then glue the acorn on the top to finish everything off. Since I still have some leaves left, I'm planning on making another smaller version of this tree. It looks pretty to see things like this in different sizes in a display. It also looks really great sitting on a candle holder in a vignette. 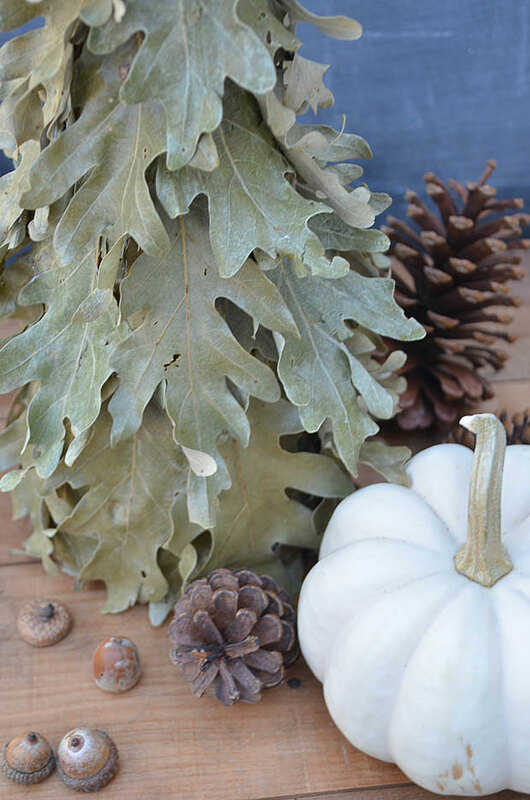 Creating this tree is a simple yet beautiful way to preserve a piece of fall to enjoy long after the leaves have fallen from the trees. It should last for years if it is properly stored. And much like preserved boxwood, you may want to spritz it with water about every month while you have it out to keep the leaves from drying out too much. When I look at my preserved leaf tree, it is a simple reminder to slow down and look at the beauty of life that is surrounding us all. What ways are you finding to enjoy this fall season?